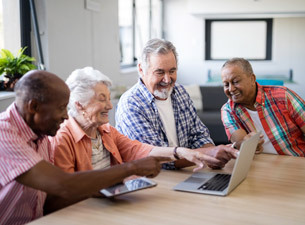 Seniors who are still healthy enough to not need constant assistance and monitoring, and those who are looking to settle down and enjoy retirement without the upkeep requirements of a home can benefit from independent living. It provides the advantages of a community setting such as new friendships, and often includes facilities such as gyms and libraries that you may not have had access to otherwise. Maintenance Free: When you are in an independent living community, all of the everyday stresses that come along with sustaining a home are taken care of for you. You no longer have to bundle up in the winter to clean off your driveway and sidewalk amidst the falling snow, mow the lawn, or deal with the hassle of broken appliances needing maintenance specialists. Everything is handled by the staff, allowing you to relax and enjoy yourself worry free. Amenities: All of the amenities and facilities inside the community are yours to use and appreciate and are included in your monthly rent. These may consist of gyms, wellness programs, spas, entertainment rooms, and libraries. Social: There are a wide variety of programs and activities that promote socialization, which opens up many excellent opportunities to make new friends. You may have more in common than you think, and the chance to connect over shared interests with other like-minded individuals is a valuable and joyful experience. Help When Needed: Staff is available 24/7, ensuring that any time you need help or assistance, someone will be there. This gives both you and your family peace of mind that you will be well looked after in case of an emergency. Healthy, Nutritious Meals: In-house chefs and cooks prepare a variety of options for each of your daily meals, with ready-made snack options like sandwiches and wraps available as well. These meals are healthy and provide you with essential vitamins and nutrients. You are encouraged to come to meal times to be sure you are staying healthy. The Holiday Independent Living Retirement Community is a family-owned business in our 50th year serving West Hartford, Connecticut. Monthly rent covers all the services and amenities offered. We provide each of our residents their own unit with individually controlled heating and air conditioning, as well as two buzzers to be able to reach our 24/7 staff if needed in an emergency. There are no household chores to worry about, as daily housekeeping tasks are handled by cleaning staff, and laundry services include our linens as well as personal items. Three meals are prepared fresh each day to provide a nutritional selection and appeal to a variety of tastes. All utilities except for internet and phone lines are included, and we invite you to bring your own furniture to help make your new home feel more comfortable. 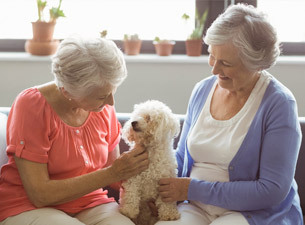 Pets are welcome provided they are building appropriate and able to be fully cared for by the resident. There are no age requirements to live at The Holiday, as we understand that circumstances may mean individuals of any age would benefit from residing in our community. Give us a call at 860-233-8208 to learn more about what we provide at our independent living facility in West Hartford, Connecticut. Fill out this online form if you would like to book a tour. 1) Is It Time for an Independent Living Community? 2) Ways To Stay Independent After Retiring?